Life in the Cenozoic Era: What is a Tapir? Tapirs (Tapiridae) are forest-dwelling perissodactyls that first appear in the fossil record during the early Eocene, about 55mya. The earliest tapirs were small animals no bigger than modern house cats, with Oligocene forms growing substantially larger reaching the size of domestic pigs. Tapirs appear to have a rather conservative body plan which has allowed them to survive relatively unchanged apart from size since their Eocene origins. The modern genus Tapirus, for example, would have been instantly recognizable to us if we could travel back in time 10 million years or more. Such conservatism is in stark contrast to other modern perissodactyl groups, horses and rhinos, which have achieved a diverse array of morphotypes and ecologic niches over their long evolutionary histories. The presence of tapir bones at a fossil site is seen as a reliable indicator that the locality once covered by a well-watered forested environment during prehistoric times. 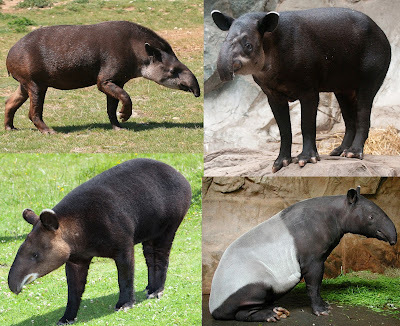 There are four accepted species of tapir alive today together with a possible fifth species (Tapirus kabomani) described in 2013 whose status is still being questioned. 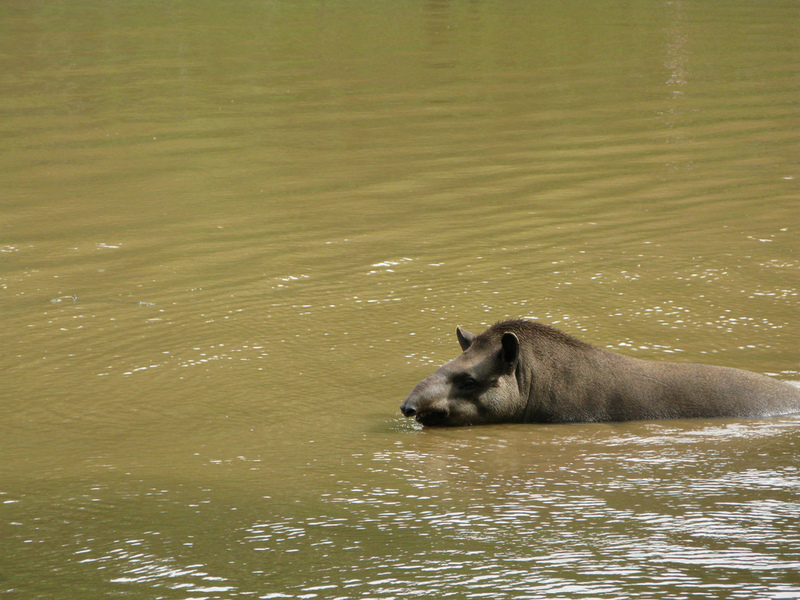 Mountain Tapir (Tapirus pinchaque), and the Asian Tapir (Tapirus indicus). The most notable attribute of tapir anatomy is the fusion of the nose and upper lip into a short trunk or proboscis, similar to those of elephants. This appendage is a highly mobile and dexterous tool used to gather and manipulate food. To support this structure, tapir skulls have had to undergo considerable modifications compared to other perissodactyls. The nasals have migrated to the back of the skull and the eyes have been moved forward. Certain elements of the facial skeleton itself have been retracted and reduced and the airway has become inclined relative to the long axis of the skull. 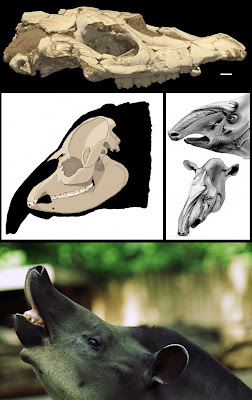 These cranial features in modern tapirs that are associated with the presence of the proboscis are present as far back as the late Eocene-early Oligocene genus Colodon. is remarkably similar to that of the modern Lowland Tapir (middle-left). which comprise the highly mobile proboscis (bottom). Top image: Figure 1 from Colbert, 2005. Middle-right image: Figure 2 from Witmer, 1999. All tapirs, both living and extinct, are small to large forest-dwelling browsers with muscular, compact bodies and digitigrade feet. There are four toes on the front feet and three on the rear feet. 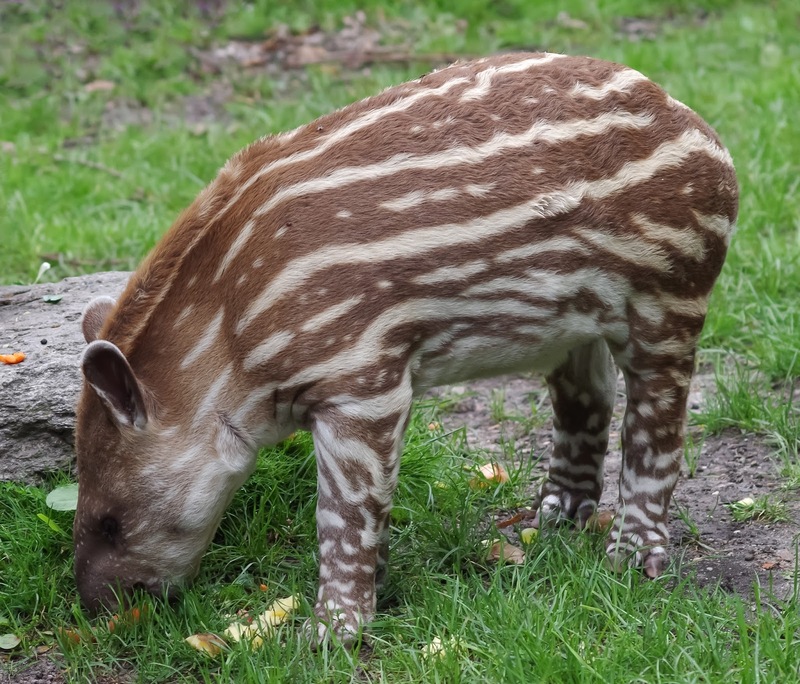 For the first months of their lives, tapir calves have a coat of short, brownish fur patterned with pale stripes and spots which serve as efficient camouflage on the forest floor. Tapir cheek teeth are bilophodont, that is, the transverse crests have joined to form a continuous ridge which helps break softer plants. Ironically, the canine teeth are greatly reduced in size and often lost in adult tapirs, while the third upper premolars are enlarged and are caniniform in shape. A mounted tapir skeleton at the Montbeliard Museum of Natural History (Wiki). The modern tapirs are generally thought of as short-haired animals associated with the warm forests of the tropical zone. However, tapirs have undergone most of their evolution and dispersal in the seasonally cool, temperate forests of Eurasia and North America. The vast expanses of grassland and desert habitat in the Middle East and northern Africa have served as a natural barrier preventing the group’s dispersal into Subsaharan Africa, and their dispersal into South America was a relatively recent event that took place during the Pleistocene. 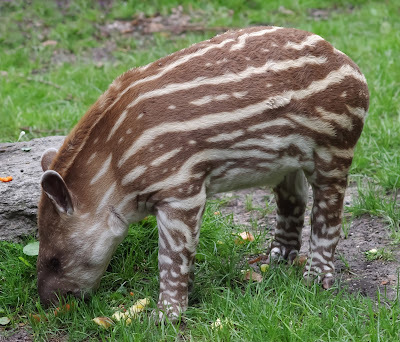 Among the four living tapirs, the Mountain Tapir is adapted to live in the cold, montane forests of the Andes Mountains and is clad with a thick coat of wool-like fur. Thus, this species is a good model when attempting to reconstruct the more northerly distributed tapirs that existed during the Pliocene and Pleistocene. coat pattern until they attain their adult coloration after their first year of life (Wiki). All tapirs demonstrate a fondness for water and will spend large parts of the day swimming or resting in rivers and lakes. They will instinctively retreat to deep water when they sense a predator. Tapirs consume a wide variety of leaves and fruits in their respective habitats and are important seed dispersers in their ecosystems. Some plants have, in fact, formed mutual relationships with these animals in which they may only germinate after passing through the digestive tract of a tapir. much of their time in bodies of freshwater (Wiki).